The Virtuoso Conductor allows easy import of user-level CA (Certificate Authority) Keys through System Admin -> User Accounts -> Edit. 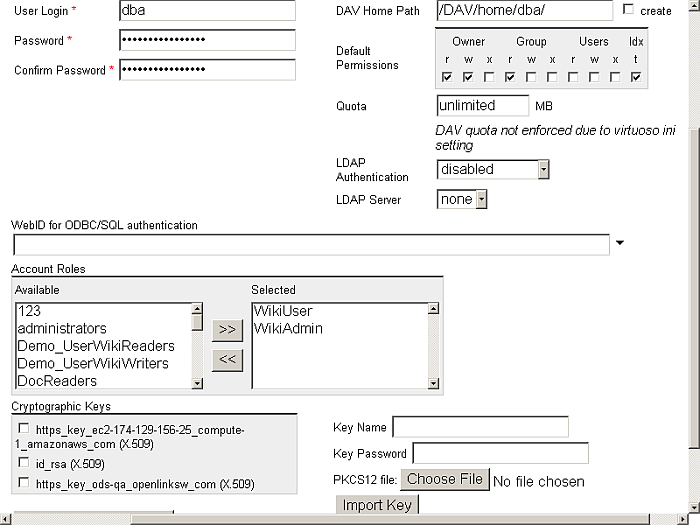 The dba user (typically) or other users may need CA keys to execute different services. A signing authority (e.g., RSA Labs) generates a site certificate. The site certificate is used to generate certificates for ODS users. The site certificate is imported with name id_rsa for user dba using the Conductor. As a result, the ODS user certificates can be authenticated against the site certificate. If there is a service that requires a different key, the Conductor can be used to import another certificate for the relevant user. You can use a Key from a global signing authority or produce a self-signed key using the Virtuoso Conductor . Details and more information how to generate the key see in the next section.